Digital transformation, a process that is already well underway across geographies and industries, is demonstrating its value by driving innovation. Modern businesses face tough economic and political conditions and are burdened with the need to constantly innovate, seek new opportunities, and defend themselves against disruptive competition. The IT department, viewed as the engine room of innovation, is thus increasingly expected to deliver not only improvements, cost savings, and efficiencies in existing processes, but also real business transformation as well. The 3rd Platform – and its key pillars of cloud, mobile, social, and big data analytics – is coming into its own as a facilitator of this new generation of technology-led business innovation. Moreover, a new innovation ecosystem is arising on top of the 3rd Platform, made up of emerging technologies such as the internet of things (IoT), machine learning, and next-generation security, as well as advances in user experience (UX). Businesses that develop and embrace a culture of innovation will be best placed to enhance their competitive performance, generate new sources of revenue, and defeat disruptive competition as it arises. 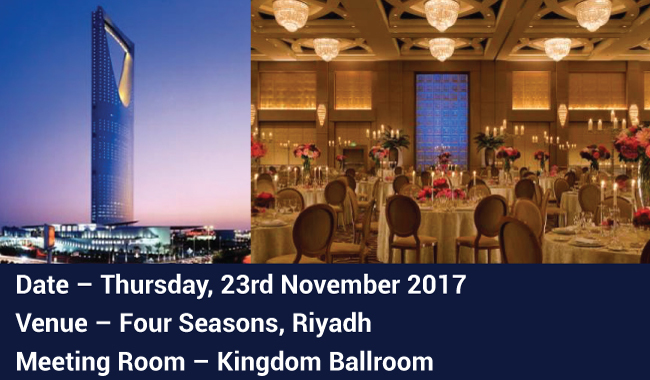 IDC’s 2017 IT Forum will examine the reasons behind the accelerated drive toward innovation and identify the immense contributions that IT managers will be expected to make over the coming years. National Business Development Manager, Saudi Xerox Agencies Co.
Commercial buildings are undergoing a dramatic transformation in network coverage, capacity, and connectivity. Wireless devices, bandwidth capacities, and connectivity speeds are evolving at a breakneck pace that shows no signs of slowing down — especially within the modern building. Trends like the Internet of Things (IoT), network convergence, and 5G will also continue to transform indoor communications. To keep up with these trends and fully prepare for the future, this presentation will explore how private enterprises can realize the value of providing smart and dedicated indoor coverage. This presentation will shed light on the threat lifecycle management (TLM) framework. TLM puts organizations a step ahead of their attackers by providing an end-to-end security workflow that combines people, processes, and technology. TLM empowers organizational teams to sort through the noise and thereafter highlight and investigate high-priority threats. Enterprise datacenters today must be able to handle an ever-increasing variety of workloads. A converged compute and storage infrastructure can help increase workload performance over distributed systems while eliminating the need for application silos. Software-defined infrastructure promises to offer reduced costs, simpler management, greater flexibility, and lower power consumption. This session will discuss the various benefits, challenges, and approaches associated with the task of implementing software-defined infrastructure. The GCC nations are emerging as leaders in the adoption of disruptive technologies as they look to accelerate their economies towards digitization. Governments are prioritizing and promoting the adoption of breakthrough technologies such as cognitive/AI, big data analytics, robotics, 3D printing, IoT, and AR/VR in order to improve the lives of citizens, enhance productivity, and foster innovation. In this session, senior executives from organizations at the forefront of innovation will discuss their vision of the technology landscape in the next 10 years. 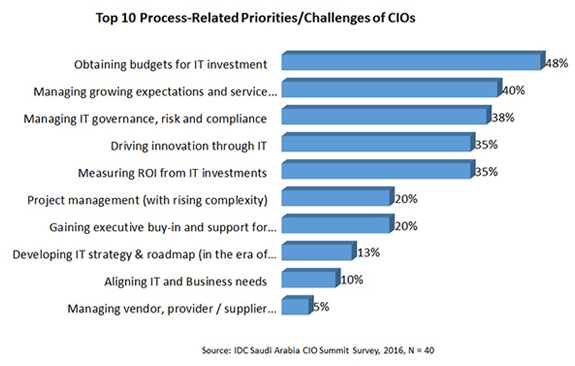 For many CIOs, to say that 2017 has presented its fair share of challenges is clearly an understatement. On the one hand, budget constraints have forced IT departments into a 'leverage and optimize' mode as part of broader cost reduction mandates, while on the other the business requirements have become significantly more demanding due to volatility in the markets. Organizations have been forced to rethink investment strategies – and any new capital expenditure is coming under intense scrutiny. As a result, new pricing and service delivery models have becoming more attractive where more flexibility is available. This presents us with an opportunity to think about what the 2018 technology landscape would look like, and in this respect CIO's are asking a number of questions as they start making plans for the future. This session will attempt to answer these questions, as well as provide a healthy platform for debate to ensure that attendees can share best practices where relevant. Hear from progressive CIOs from various industries describing how recent findings from the business literature have revealed a major challenge to today’s successful organizations. The session also discusses the ability to anticipate, and prepare for, continuous and disruptive market change. While many organizations have been created, and indeed prospered, around a key successful business idea, often this success has ultimately encumbered the organization, and made it difficult to adjust to changing market realities. As a result, the established successful organization may face significant challenges to continued market dominance. With more than 2,000 customers in over 60 countries, ForeScout Technologies is transforming security through visibility, providing Global 2000 enterprises and government agencies with agentless visibility and control of traditional and IoT devices the instant they connect to the network. Its technology continuously assesses, remediates, and monitors devices and works with disparate security tools to help accelerate incident response, break down silos, automate workflows, and optimize existing investments. Spectrami delivers niche and specialized technologies to customers in the Middle East and leverages its successful business model to achieve seamless service levels that are on a par with leading vendors in region. The company seamlessly delivers enterprise solutions by utilizing a multipoint engagement strategy covering sales, presales, marketing, delivery, and channel fulfillment functions. LogRhythm, a leader in security intelligence and analytics, empowers organizations around the globe to rapidly detect and neutralize damaging cyber threats. The company’s patented award-winning platform uniquely unifies next-generation security information and event management, log management, network and endpoint monitoring, user entity and behavior analytics, security automation and orchestration, and advanced security analytics. In addition to protecting customers from the risks associated with cyber threats, LogRhythm provides unparalleled compliance automation and assurance as well as enhanced IT intelligence. LogRhythm is headquartered in Boulder, Colorado, with operations throughout North and South America, Europe, and the Asia Pacific region. Why sponsor the IT Forum 2017?